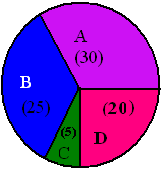 Pie chart (circle graph) - A special chart that uses "pie slices" to show relative sizes of data. 1) Calculate Percentages : For data that is not already given as a percentage, convert the amounts for each part, or data group size, into a percentage of the whole. 2)	Draw the Graph : Draw a circle and draw in a sector for each data group. Try to make the sector sizes look as close to the percentage of the circle as the percentage of the data group. 3) Title and Label the Graph : Label the sectors with the data group name and percentage. Then add a title to the graph. This is the same as the title of the table. The following table represents the area of the various continents of the world in millions of km 2 . Draw a pie graph for the data.